This phenomenon, recall, is that, while conventional measures of output (i.e. GDP) show the US economy growing strongly in recent quarters, employment is stagnant. Over 26 million workers, around 17% of the labour force, are now either unemployed or underemployed (i.e. discouraged from looking for jobs or unwillingly working part-time). Seven million fewer jobs exist than in December 2007, at the start of the Great Recession; the working-age population has grown by nearly 4 million people over that period. Foley suggests that something is wrong with the standard metric for economic activity. The national accounts overstate the level of output contributed by various sectors, which explains why fluctuations in the total correlate so poorly with labour-market performance. In fact, says Foley, some measured activities do not contribute to the total product at all. Such activities are supported entirely by the surplus generated in the productive or “basic” sector. Observe how the financial system moved from paper record-keeping to electronic databases. Increased technical efficiency would, ordinarily, reduce the amount of labour and resources required to perform an activity. The mechanization of agriculture, for example, eliminated the peasants of Europe. But the automation of financial ‘services’ has not reduced the number of bankers and brokers. Quite the reverse is true. This is because finance, as an unproductive sector, grows proportionately with the surplus generated elsewhere, consuming ever more resources. The wages, profits and rent received by participants in these unproductive or ‘non-basic’ activities deduct from society’s output. Expansion of the unproductive sector increases the magnitude of claims on wealth, thereby reducing the surplus available for productive investment and employment. Since the 1970s economic and employment growth have increasingly diverged, prompting the general population’s standard of living to stagnate. 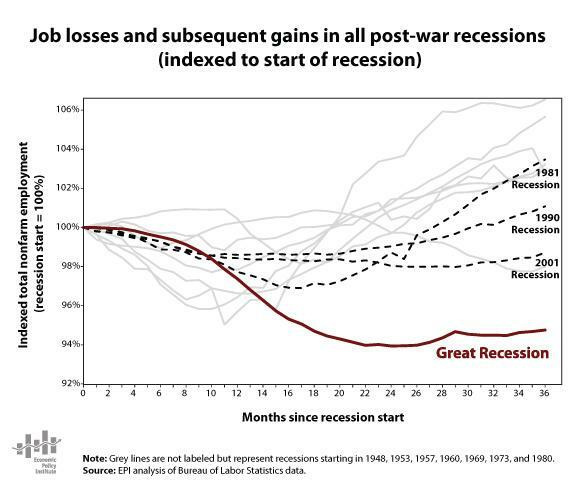 With each successive US recession, ‘recovery’ has involved less and less employment growth. But Foley includes as unproductive sectors health and education. He seems to suggest that the entire service sector is unproductive. Yet health and education are essential for the material reproduction of society and of the capacity to work of the employed population. On most reasonable definitions and typologies of productive versus unproductive sectors, such as those by Shaikh and Tonak, Roy Grieve or Dave Zachariah, they are considered to be productive. This entry was posted on February 15, 2011 at 4:45 am and is filed under Economics. You can follow any responses to this entry through the RSS 2.0 feed. You can leave a response, or trackback from your own site. Michael Roberts has published a blog post, “America: from progressive to rentier”, making the same point as this one, but with some interesting charts.